I biked my entire pregnancy; in fact, I was still cycling the day before I went into labor. Not only did doing so keep me sane, it also ensured that I had a healthy pregnancy and a healthy baby. More and more moms that I know are biking throughout their pregnancies as well, but as I talk to them a common theme seems to emerge—a problem in finding maternity bike clothes! When I was pregnant, I relied on one pair of Terry maternity bike shorts (that I washed A LOT). Unfortunately, it appears that Terry doesn’t make these anymore which is SAD. My baby bump was also relatively small so I never invested in any maternity jerseys. Instead, I would wear maternity tank tops under some of my looser jerseys, and toward the end of my pregnancy I wouldn’t zip them all the way. If you already have maternity exercise clothes, you might also just decide to just use those and forgo buying cycling-specific clothes. Yeah, you might look like a noob, but it’s just 9 months right?!? If you do want to find bike shorts and some maternity specific bike jerseys, I’ve tried to save you some time to round up a list of the (very limited) options on the market. With no further ado, the Best Maternity Cycling Clothes (or items that aren’t maternity-specific but that you can make work for a pregnant belly) ….. This maternity bike short (unlike many I’ve found) actually has a chamois. A nice wide 2” waistband keeps things comfortable around your growing mid-section. StellaMaternity.com. Almost every woman I’ve talked to who biked thru their entire pregnancy ended up wearing bib shorts. Bib shorts, while not maternity specific, work well for pregnant bellies because there is no waistband. Order a size larger than what you would normally wear and you should be able to make them work for a full nine months. One of my favorite bib shorts is the Sugoi Women’s Evolution Bib Short. Amazon.com. This isn’t a bike short, but is a good option for pregnant women. Cycling briefs are just padded underwear that you can wear under a pair of gym shorts or similar. They will fit under your pregnant belly and won’t break the bank either. My favorite pair is the Club Ride Women’s Jewel Liner. They come in cute colors too! Amazon.com. These are NOT padded bike shorts, but if you are okay with that, they will work. The best part is that they are cheap! Buy at Amazon.com. Sheila Moon actually has a fairly large selection of maternity jerseys in multiple colors and designs. They also offer both sleeved and sleeveless jerseys. Sheilamoon.agiliron.net. This is NOT a maternity specific jersey, but may work well for your first couple of trimesters. It is designed with an extra-long torso, and if you order a size or two up, it should fit over your belly pretty well. Amazon.com. 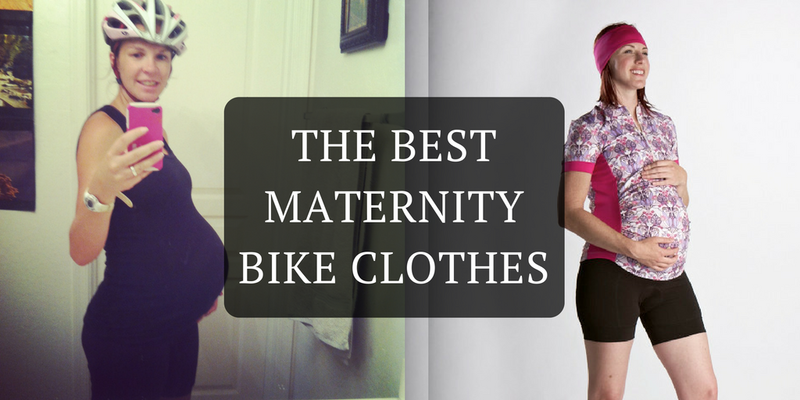 The maternity bike clothes market is pretty weak. Keep your head up and make due for nine months. Before you know it, you’ll be back in your old bike clothes. And if you decide to start your own maternity cycling clothes line, let me know!